A puppy’s sensitive period is 4 to 16 weeks of age. The sensitive period for socialization is one in which puppies are most easily socialized to stimuli. A sensitive period is a time when a small amount of work or no work at all can have a large impact on the dog’s future behavior. While older dogs can be socialized, it is much more difficult after 16 weeks old. At 8 weeks, the fear reaction is fully developed; however, sociability outweighs fear until the puppy is roughly 16 weeks old. This phenomenon makes it easier for the puppy to be introduced to frightening stimuli without permanent fear setting in than it would if older. If a puppy is not exposed to new stimuli between 4 and 26 weeks, she is more likely to be fearful of those stimuli. Socialization doesn’t mean simply expose the puppy to all stimuli without reinforcements. The exposure must cause positive conditioning and should promote confident, calm behavior. There are a number of possible contributing factors that affect the reaction to noise, including inadequate socialization or genetic predisposition. Noise phobia may arise spontaneously or following a fearful event, though often a specific cause cannot be identified. Audio desensitization using a pre-recorded sound. Begin by playing the sound at a level where you barely know it’s on. Go about your normal day with your pet, playing, eating, resting, and allow the sound to continue. At such a low volume your pet may not even know it’s playing. If your pet seems agitated, decrease the volume. Once the audio sound is playing and it is not noticed, increase the volume in very small increments and again go about your normal day. You should be able to slowly increase the volume to a realistic level. Always back the sound down if any signs of anxiety arrive. Establishing a conditioned response to a location, such as a mat near the owner. Practice the conditioned response technique on a daily basis and make it a normal expected routine. Place the mat near you, on the floor if you’re on the sofa or at your feet if you’re at your desk. Have your pet come sit and if possible, lie down on the mat and give him/her a treat filled enrichment toy that he/she only gets on the mat. If your pet stands up or leaves encourage him/her with a treat to once again sit on the mat and relax. The mat becomes the safety zone and can be moved and taken anywhere you travel. 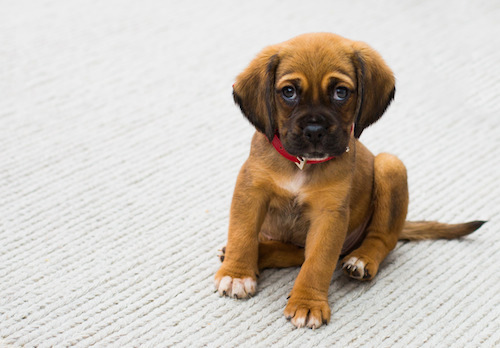 Environmental management includes allowing the pet to have a “safe place” where they can be immobile, such as a crate, a closet or an interior bathroom. Help drown out the offensive sound with a radio, T.V., fan or a white noise machine, all at a calming tone. DO NOT punish your pet for their unwanted behavior. They are panicked and if you punish them you will teach them not only to be afraid of the sound but also to be afraid of you. DO NOT entice your pet into your lap or cuddle them. While cuddling may seem like the most loving thing to do, in the long run, it will actually worsen your pet’s behavior. First, it teaches your pet that you are the only way to stay safe when they are frightened. Unfortunately, you will not always be there during a frightening situation. Second, cuddling doesn’t give your pet any instructions on how to feel safe. As a result they will never learn the tools that they need to feel calm.